The events of the past few months (and indeed the past few years) in Sri Lanka have puzzled me. The President and his coterie are flagrantly violating the Constitution and laws. That is shocking, but what is more shocking is the casual acceptance of this behavior by all concerned. What is surprising is not that the President violates the law and disregards explicit directions from lawful authority, but that the citizenry seem to accept it. Not that the President tries to impress university teachers by inviting them to dinner at Temple Trees, but that most of them go, and some even kiss the hands of their host. Constitutionalism as a theory and in practice stands for the principle that there are—in a properly governed state—limitations upon those who exercise the powers of government, and that these limitations are spelled out in a body of higher law which is enforceable in a variety of ways, political and judicial. This is by no means a modern idea, for the concept of a higher law which spells out the basic norms of a political society is as old as Western civilization. That there are standards of rightness which transcend and control public officials, even current popular majorities, represents a critically significant element of man's endless quest for the good life. (Fellman,1973-74: 491-92). This basic idea of constraints on power may not really be Western, as evidenced by the story of the cow seeking and receiving justice from King Elara 2000 years ago. But perhaps, that story was told because it was so exceptional. In any case, the story is from the Anuradhapura era, the highest manifestation of Sinhala-Tamil civilization in this country (King Elara was Tamil). Our proximate connection is to the Mahanuwara era, the lowest form of Sinhala-Tamil civilization in this island, where the kings exercised absolute power, constrained not by abstract notions of justice, but only by the concurrence of the Sangha and the fealty of the Kandyan feudal lords (the British conquered Kandy when Sri Vikrama Rajasinha/Kannasamy and his feudal lords fell out). One may differ from Fellman’s claim that Constitutionalism is a “Western” or Judeo-Christian construct. The Hammurabi Code, the oldest known body of law, is often used as an illustration of fundamental laws that even the king cannot change, and the acceptance of which constitutes Constitutionalism. This is not the place for an extensive historical digression, but one may hypothesize that complex urban civilizations with extensive divisions of labor require Constitutionalism, while the more primitive forms based on subsistence agriculture or hunting and gathering do not. This hypothesis suggests that the Anuradhapura and Polonnaruwa civilizations included forms of adherence to Constitutionalism, while the lower forms of the Kandyan period did not. We were introduced to Constitutionalism by the colonial powers, especially the British. Through experiences such as the Bracegirdle incident of 1937, where the colonial Supreme Court overruled the colonial Governor, the local elites came to appreciate the practice of Constitutionalism and lived by its tenets for several decades after Independence. Election promises could be, and were, broken, but laws were respected and obeyed. When the 1945 Soulbury Constitution, especially the entrenched Article 29(2) ("the Parliament of Ceylon shall not make any law rendering persons of any community or religion liable to disabilities or restrictions to which persons of other communities are not made liable, ...") and the provisions ensuring an independent civil service, proved too constraining, the politicians of the day did not simply disregard it as they do now; they carried out a Constitutional Revolution and got themselves a new, less-constraining fundamental law. Despite the revolution carried out by an unlikely coalition of Kandyan feudals (Mrs Bandaranaike was a direct descendant of a signatory of the Kandyan Convention) and assorted Marxists (some with first-hand memories of the Bracegirdle victory), the basic idea of Constitutionalism was still alive. Otherwise why did they go to all that trouble? The 1972 Constitution was an abomination: it stripped the safeguards for minorities and broke the back of the administrative service; its adoption without the participation of the Tamil parties created the conditions for civil war. It was replaced by the 1978 Constitution fully within the amendatory provisions of its predecessor. Even the removal of Supreme Court judges was done within the letter, if not the spirit, of the law. JR Jayewardene kept fiddling with the 1978 Constitution, amending it over and over again and ruining its integrity. He was autocratic, but within the bounds of Constitutionalism; just like his friend Lee Kuan Yew of Singapore, who used the law to subjugate his opponents. It took the next generation of Kandyan feudals to start eating away at Constitutionalism. The attack began with the appointment of a controversial Chief Justice under instructions to mangle the 1978 Constitution by interpreting it to permit cross-overs of MPs. Still the façade of Constitutionalism was preserved; just that an unprincipled Chief Justice was interpreting it in ways that served short-term interests of the then President. But by corrupting the highest court, that descendent of the Ratwatte Disave, commenced the insidious final assault on the last bulwark of Constitutionalism and prepared the ground for the restoration of feudalism as the political framework of Sri Lanka. The cruder violations of the principle of Constitutionalism came with the 17th Amendment, ironically intended to be the ultimate constraint on the abuse of Presidential power. Now the façade of Constitutionalism was torn off. The President (not the current one) simply ignored the parts she did not like, a practice continued by her successor but in cruder form. The Supreme Court, then in the thrall of a lawless Chief Justice, proved no constraint. There is not enough evidence to assess the nature of the current Supreme Court, but given the grievous assaults the institution has suffered and the servility of the legal profession and the Bar Association, there is little cause for optimism. But, of course, there is always hope. Remember Pakistan. So it appears that the political elite’s dalliance with Constitutionalism has about run its course, sixty years after Independence. We are reverting to our native Feudalism: not just the ruling family but large swaths of the populace, including opinion leaders and intellectuals. For example, Ven Maduluwave Sobitha Thero, an erudite and eloquent senior monk, was quoted some time back in the Lankadeepa, saying that the legislature was superfluous; all we needed was a President who would be elected periodically and a judicial system. In the past, our kings used to appoint whoever they wished as Ministers, so should our Presidents. There is no need to go through the complications of electing Ministers or having them be accountable to Parliament. Not pure feudalism, where the king can do anything, but close enough. And no suggestion that the Presidency can pass from father to son, though of course there is no prohibition against the son running for office (the only one available in this truly home-grown form of government). It appears that Constitutionalism of the classic kind has been found wanting. At the end of five decades of Independence, we were still poor, still beholden to external powers, and still incapable of regaining sovereign control of the national territory. We had to shut down the city even to celebrate the fiftieth anniversary of Independence. This was not seen as a result of bad economic policy (which it was), but of Constitutionalism. When leaders with feudal mindsets gained power, there were no institutional brakes to stall their multifarious assaults on Constitutionalism, as there were in India, when Indira Gandhi tried it. The Left coalitions broke the back of the administrative machinery in the 1960s and completed the job with the 1972 Constitution, and the judiciary was corrupted in the 1990s. The assault on the media that began in the 1960s reached its apogee in 2009. The private sector could not get out of its “deal” mentality and professionals, with a few honorable exceptions, lacked spine. Now, Sri Lanka is reverting to its Kandyan state: an all powerful king and royal family; assorted feudal lords who serve at the pleasure of the king, but have limited power of their own. In the old days, the regional feudals gave the king revenue and troops, in exchange for the right to extract rents from the peasants. Today, the regional feudals deliver votes to the king at the periodic elections, in return for the right to extract rents from the private sector. As in the old days, the Sangha are consulted and placated by the king with Benz cars and assorted gifts (a practice not started by the present President) and serve as a weak check on his power. This is the larger context that explains the kissing of the President’s hands by university academics; the conversion of artistes to vandibhattayas; and the blurring of the lines between the king, the government and the state. When the President uses state resources to win elections or prints his visage on currency notes, he does not see that he is doing anything wrong, because he is no longer functioning within the “western” frame of Constitutionalism. When the President appoints his kith and kin and court favorites to positions of power and nominates them to run for political office, such actions are accepted by the more deserving party workers on the ground because they too interpret events from within the feudal frame. When I question the handing over of scarce broadcasting frequencies to political favorites without any form of transparent process, journalists question my motives, because I am the one outside the dominant feudal frame that allows the king to reward courtiers. Sri Lanka is no longer a country governed by law, but is a kingdom, with a thin veneer of Constitutionalism for external consumption. Dissonance exists only for a few like me, still unable to shed the western baggage of the Magna Carta and Montesquieu. The real question is, therefore, not about which individual wins the Presidential Election, but about whether we can (or should) get back to Constitutionalism. All successful presidential candidates since 1994 have promised to abolish the executive presidency; all have broken their promises. Constitutionalism is not words on paper, but broad acceptance across society that certain kinds of words on paper have binding authority and must be respected. It is what will give meaning to the word of a candidate. Even if the executive presidency is abolished or the Constitution is amended, nothing has any meaning unless Constitutionalism is restored. What use are words on paper, when none respect them? The larger question is the governing framework. Do university teachers rush to kiss the ring and vice chancellors prostrate themselves before Presidents in modern societies? Can we have a modern economy when the largest companies in the country obey patently illegal directions from regulators? Is it normal to name a government-owned, money-losing airline for the head of state and paint the tail of the leased aircraft with his campaign livery? These are symptoms of a transition from a Constitutional State to a feudal one. It may be argued that today’s complex, globally-connected national economy cannot be effectively managed by a bunch of Presidential cronies and that the procedures of representative democracy and checks and balances are essential, and that therefore, there is no alternative to Constitutionalism. It may also be argued that every country has a Constitution and that over time, as the economy develops and matures, as was the case in South Korea and Taiwan, Constitutionalism also takes root. But if these were true, why is it that Sri Lanka is sliding back into feudalism, just as it is becoming a middle-income country? Myanmar is governed feudally, but can a feudal system handle a complex economy like Sri Lanka’s? Are there autochthonous (why do I use this word? Because the sonorous radio broadcasts of the Minister of Constitutional Affairs in the 1970 government, Dr Colvin R. de Silva, imprinted it in my brain; it means “home grown”) checks and balances? Is the mismanagement of the economy resulting in factory closures and job losses or the destruction of the value of the Employee Provident Fund the modern-day equivalents of the rains not falling in time, thus resulting in famine and pestilence throughout the land? As the kings then were seen as responsible for delayed rains because they failed to rule according to Dharma, will our modern kings also lose legitimacy, when and if the economy heads South? Is this it? Zimbabwe and North Korea show that economic mismanagement by itself does not dethrone kings. A national conversation on Constitutionalism versus Feudalism seems a safer course. I am currently convinced that Constitutionalism, the rule of laws, not men, is what is most conducive to the happiness of our people. But I am open to persuasion that what is appropriate for the Sri Lankan climate is something else. Constitution of the Democratic Socialist Republic of Sri Lanka. 1978, as amended. Fellman, David (1973-74). Constitutionalism, in Philip P. Wiener, ed., Dictionary of the History of Ideas: Studies of Selected Pivotal Ideas, vol. 1, pp. 485-92. Citizens of Sri Lanka should heed this warning to the framers of the US constitution. The Sri Lankan Presidency was, until recently, a fixed executive, not dependent or answerable to parliament and not removable except for limited reasons. Head of the State, the Head of the Executive and of the Government, and the Commander-in-Chief of the Armed Forces. With the power to appoint higher officials, Supreme Court judges, the Police Commissioner, Elections Commissioner it was, essentially an elected monarch. Did Sri Lanka throw off the British crown only to replace it with local one barely half a century later? In theory at least, the colonial administrators of Ceylon were answerable to a British Parliament. For all practical purposes, Sri Lanka’s presidency answered to no one. The 19th amendment restored some independence to institutions but mere independence is insufficient. Their proper functioning is dependent on the attitudes and competencies of their members, a question that must be addressed. The 19A is also incomplete, to erase the legacy of decades of authoritarian rule and secure rights further reforms beyond the constitution are needed. The problem is best understood if viewed from the perspective of what matters to citizens: individual freedom. If we call ourselves “free”, how must individual freedoms to be protected and advanced? The fundamental problem in political theory is two-fold: on one hand there is a need for an “enforcing agent” which will protect the individual from violations of his/her liberty; on the other hand is the problem of how to ensure that any “enforcing agent” does not in its turn become a violator of the very same liberty it was originally set up to protect. The Roman poet Juvenal expressed it as “Quis Custodiet Ipsos Custodes?” [who will guard us from these guardians?]. Individual liberty, simply defined is freedom from coercion. “Coercion occurs when one man's actions are made to serve another man's will, not for his own but for the other's purpose.” (Hayek) . Coercion of a citizen: aggression, threats etc may arise from individuals, organisations (such as religious bodies) or the state. "Free society has met this problem by conferring the monopoly of coercion on the state and by attempting to limit this power of the state to instances where it is required to prevent coercion by private persons”(Hayek) . This means the state is given the sole right to exercise coercion, but it must do so only to protect citizens from the coercion of others. “Freedom is achieved by limiting some kinds of actions – coercive ones – in order to encourage other kinds of actions – non-coercive ones. The result is the increase of voluntary exchanges within the parameters of the law”(Lehto) . Property is the difference between what is mine and what is yours. In the classical liberal sense, it is the creation of a protected private sphere surrounded by limits that cannot be crossed without ethical transgression (Lehto) . It is a person’s entire private domain, Locke considered property rights to consist of “life, liberty, and estate”. Thus, you may not enter my house without my permission. Thus, you may not borrow my car without my permission. Thus, you may not violate my body (Lehto) . Property marks the limits of permitted action in a liberal society, the personal domain which should not be intruded into under any circumstances. A regime of legally protected property rights, in the wide sense used here is a prerequisite for liberty: “the end of the law is, not to abolish or restrain, but to preserve and enlarge freedom (Lehto). States exercise power through the machinery of state: bureaucracies, the bodies of state and local government, legislatures, judiciaries police and armed forces. Setting rules that circumscribe its use. It cannot be exercised arbitrarily by those in authority but only in defined circumstances and must follow set procedures. These are laid down by laws. Laws must be universal, applying equally to all including the government itself, no one is above the law(the rule of law). Distributing authority so no single organ of government has the practical ability to exercise power unchecked (separation of powers). As the law is the principal check on power it is essential that the process of law-making itself be subject to checks. These are the principles that must be ingrained in the constitution and the organisation of government. How true is our system to these principles? The president and parliamentarians are elected which creates accountability to the public. The weakness is that once elected, voters have absolutely no control over their representatives, except to remove them at the next election. Requiring candidates to submit to regular and periodic elections is important but other checks that restrain power on a day-to-day basis are critical. 2. Separation of powers: Parliament as a check on Government. At the apex, parliament must be a check on government. The two are not synonymous. The political party that wins the most seats takes charge of government, until the next election. The Government is responsible for running the country. Parliament is made up of MP’s elected by voters and is there to represent citizens interests and make sure they are taken into account by the Government. They are not a part of government. Government ministers may have seats in Parliament but most of their work is done in Government departments. Parliamentary Debates may be about legislation, government activity (policy or implementation), or issues of public concern. Parliamentary questions (in the UK tradition) allow MP’s to seek information or to press for action. They oblige Ministers to explain and defend the work, policy decisions and actions of their Departments. Investigation-drilling deep into issues, is carried out by Committees. The ultimate form of parliamentary control is that it can force individual ministers, or even the entire Government, to resign in votes of no-confidence. For these processes to work, MP’s must be independent. It requires opposition MP’s and backbenchers in government who will question their own policies but in Sri Lanka this is absent. According to the prevailing version of proportional representative system, the constituency votes for the party first and the individual later. The party hierarchy is empowered to expel any of its members who vote against the party and replace him/her with another member of the party. An expelled MP automatically loses his/her seat. As MP’s who dare defy their leaders may be ejected independence is lost. Instead of representing the citizens interests, they represent the party leaders interests. MP’s cannot defy party diktat but a supreme court ruling allows them to cross-over without losing their seat. This enables the government to lure MP’s by offering them positions, securing a permanent voting majority. As MP’s fear to question, parliament becomes a rubber stamp, not a check. Laws are what limit power, but if parliament cannot check government bad laws may be passed. Under bad laws, power is legitimately exercised but oppresses citizens, a situation of rule by law as opposed to the rule of law. The Emergency laws or the Prevention of Terrorism Act are examples. Debates and questions allow issues to be discussed but committees are concerned with fact-based investigation. They go into issues in-depth in a way that Parliament, as a whole, has no time for, collecting and examine evidence to develop an understanding of what the government is (or is not) doing under its democratic mandate. They can examine what the outcomes of activity (or inactivity) have been, including by requiring explanation from government. They can summon experts, stakeholders, demand answers from ministries, send for papers, and documents. In the UK, there is a strong emphasis on committee reports being based on evidence, primarily that collected by the committee. The Government is required to respond to reports. Committees provide the greatest scrutiny but until the 19th amendment, Sri Lanka had only ceremonial “consultative” committees. Instead of opposition members chairing committees (as in the UK) Sri Lanka’s were chaired by a minister of government. The government was not required to respond to any reports, effectively rendering them useless. The 19th amendment has charged committees with oversight and they are now chaired by an opposition MP which is big improvement but the reforms still fall short. A single chamber legislature, if unchecked, could become dictatorial. Creating an upper house of parliament that checks and challenges government is one safeguard to bad laws. The Soulbury constitution had an upper house- the Senate consisting of 30 members; 15 elected by the lower chamber and the rest appointed by the Governor-General. Specialised training - MP’s (and their staff), particularly those in committees would benefit from specialised training. Even established democracies (UK, Australia, Canada etc) have induction programmes for new MP’s. At a minimum Sri Lankan MP’s must be made more familiar with their constitutional responsibilities, rules of procedure, human rights, gender equality and public finance. Open committee hearings to the public - One way to improve scrutiny is to open the hearings to the public. The presence of media and interested citizens will have a salutary effect on the participants and allow greater public discussion on relevant issues. Government must be required to respond to committee recommendations. Sweden has a Constitution Committee that is tasked with ensuring that the Swedish government ministers follows the rules for the government—namely, the Swedish Constitution and Swedish law. The committee consists of forty-four members representing all parties of and has the power to hold hearings, conduct investigations, and request classified materials from Mps. The Committee can act on its own initiative or in response to complaints from MPs (not citizens) and can initiate the prosecution of crimes committed by MPs in their capacity as MPs (decided by the Supreme Court). The House of Lords Constitution Committee’s role is to examine all bills for constitutional implications (a check against legislation that infringes basic rights) and, even more importantly, keep under review the operation of the constitution. This prevents the constitution itself from being undermined by ensuring that changes are not made “without a full and open debate and full awareness of the consequences”. It fulfils the second limb of its remit by carrying out investigative inquiries into constitutional issues, engaging a specialist advisers (external experts) and taking written and oral submissions. alteration to the balance of power between Parliament and government, including the conferment of unduly broad or ill-defined powers to legislate by order. Article 80(3) prevents the people from challenging provisions in laws that have been enacted by the legislature. Article 35(1) – (3) of the Constitution of Sri Lanka conferring immunity upon the President from civil or criminal proceedings. Power of the president to pardon any offender (Article 34) undermining the judiciary. In effect, associates of the president able call on his/her goodwill may be above the law. Article 89 disqualifies criminals from standing for office, but the President may overrule this under article 34. Until the 19A all supreme court judges were appointed by the president, making the courts beholden to that office. The 19A restored this power to an independent commission. Steps to strengthen independent commissions are discussed in more detail below and the general remarks also apply to the judiciary. Clear criteria for selection of judges and a rigorous recruitment process based on competitive exams. 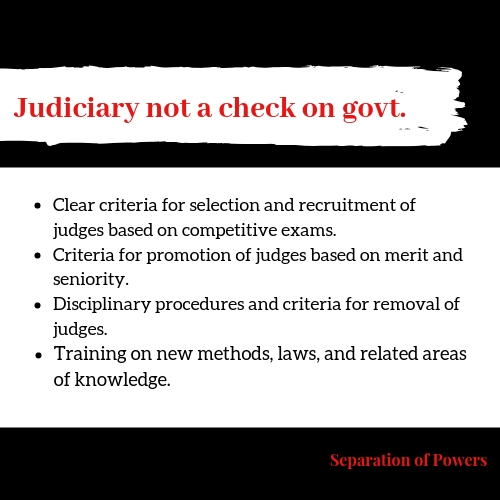 Standard criteria for promotion of judges based on merit and seniority. Disciplinary procedures and standard criteria for removal of judges. Initial and on-going training on new methods, laws, and related areas of knowledge including mandatory training in international human rights law. Rights are granted by laws but their enforcement depends on the system of justice. It must protect the rights of citizens against infringement by others, including the government and the powerful. The police maintain the law, protecting people and their property, preventing crime. Courts provide redress for wrongs. The Attorney General prosecutes crime. Sri Lanka system falls woefully short, according to the ICJ “efforts to seek justice are frustrated by investigative, prosecutorial and judicial lack of independence, impartiality and capacity, all of which continue to contribute to a pervasive culture of impunity within the system”. To provide security and maintain the rule of law the police are given special powers: to arrest and detain and the power to use force. This monopoly on the use of force place the police in a unique and sensitive position within the democratic State. Adequate control mechanisms are required to ensure that these powers are consistently used in the public interest. Risk of misuse include: police brutality, deaths in custody, torture and ill-treatment, extrajudicial killings, enforced disappearances and excessive use of force, including in cases of demonstrations. Laws specifying functions and powers of the police (in line with international human rights laws). Operational procedures/instructions that reflect the spirit and letter of the law. Complaints mechanisms, both to police leadership and external bodies. Procedures on dealing with misconduct, disciplinary and criminal, overseen by an independent body. For example the UK police are subject to the Police and Criminal Evidence Act 1984, which set the powers of police on matters of stop and search; entry, search and seizure; arrest, detention and the questioning of suspects. Failure to follow these rules can result in failures to secure convictions because the courts render inadmissible any evidence which has not been fairly obtained. Codes of Practice created under the Act govern cautioning procedures, identification parades and a range of other responsibilities. Breach of the codes is admissible in evidence in criminal or civil proceedings against the police. Separately the UK has a Human Rights Act, requiring all public bodies to respect human rights. They may be taken to court for failure. Sri Lanka’s police ordnance of 1865 needs to replaced by something on the UK lines along with standard codes of practice. Sri Lanka needs proper legal protection for human rights. Currently human rights have weak protection under the (circumscribed) fundamental rights chapter, the ICCPR Act, No. 56 of 2007 and the Human Rights Commission . Article 15 of the constitution restricts fundamental rights in for a variety of reasons including parliamentary privilege, contempt of court, defamation. Article 16 allows any pre-existing laws to prevail notwithstanding inconsistency with fundamental rights, effectively limiting its application. The Sri Lankan ICCPR Act makes a mockery of the International Convention on Civil and Political Rights. It contains only four main substantive rights-conferring provisions (compared to the 20+ in the international act) and these too in abridged form. “The Sri Lankan bill of rights is incomplete and structurally incoherent.”(Welikala &Edrisinha). Therefore, repeal articles 15 and 16 of the constitution, amend the ICCPR act in line with international practice and consider a new human rights act. The Attorney General’s Office’s (AGO’s) must be willing to pursue prosecutions independently, even against other state actors and courts must ensure fair and timely trial. In Sri Lanka, the Attorney General is the Chief Legal Advisor to the Government and appears on behalf of the Government or its agents in any Court or Tribunal. It is also the chief prosecutor, which creates a conflict of interest where the state or its agents are involved. The ICJ notes “a lack of will to prosecute State actors in human rights cases, particularly those relating to the conflict”. The practice of drawing judges from the AGO creates a further conflict: “the judiciary has an entrenched institutional loyalty in favor of the executive”. Create an independent Director of Public Prosecution (DPP) to handle all prosecution. The police should no longer prosecute but confine themselves to investigation. The AGO should be limited to acting as advisor to the government. The UK Royal Commission on Criminal Procedure, looking at the role of the police as prosecutors, the Commission found that a police officer who carries out an investigation, inevitably, and properly, forms a view as to the guilt of the suspect. They felt, however, that without any improper motive the officer may then be inclined to shut his mind to other evidence which undermines that view or overestimate the strength of the evidence gathered. In the absence of effective oversight, there was also greater opportunity for police corruption. The DPP must be governed by a code of practice that sets out principles on which to prosecute. One of the most important tasks is to review the evidence in the file in order to decide whether it justifies the charge laid by the police, applying criteria set out in the Code of practice. They must determine if evidence is sufficient, reliable, credible and if prosecution is in the public interest. The practice of drawing the judiciary from the ranks of the AGO or the DPP should cease. The administrative machinery is, for many citizens, the only ‘face’ of the state that they experience. As it is responsible for the delivery of basic services it wields real power over the lives of ordinary people. Lack of information-on regulations, compliance procedures; insistence on meaningless procedures, unjustified fines or burdensome inspections that violate an agency’s own protocols are examples of bureaucratic oppression-actions that impose unnecessary and harmful burdens on citizens. These stem from poor organisational practices and the attitudes of officials. Although all citizens suffer, minorities and the poor are more frequent victims. More sinisterly, political opponents may be persecuted using particular provisions. For example, the Inland Revenue Department is known to have ‘raided’ opposition politicians during the election in 2010. Instead of impartial tax administration, the powers of the department were being abused, turning it into a tool for harassment. Similarly, the immigration department has revoked visas of journalists and aid workers without warning. The administrative machinery needs to be neutral, delivering services without discrimination. Politicians are inevitably subject to short term and selfish pressures so the administration must be insulated from political pressure. The careers of the staff should not be dependent on politicians but vested with independent commissions, which must control recruitment (on merit, based on competitive exams) promotions and transfers. Politicians should not be able to appoint cronies, punish or reward officials. Independent mechanisms should handle complaints. The 1978 Constitution originally vested in the President the power of appointing several “independent” commissions including the Public Service Commission, the Judicial Service Commission, the Bribery Commission, the National Police Commission and the Human Rights Commission. The 19A removed that executive power. The President still appoints people to these and other independent commissions but only those recommended by the Constitutional Council. In establishing the Constitutional Council, the President is entitled to appoint five members, but is required to accept the nominations of the Prime Minister and the Leader of the Opposition. The problem is independence will not change the staff or practices of the bureaucracy overnight. Some staff will be political appointees only familiar with executing political directives and may continue to do so out of habit or loyalty. A set of general recommendations follow. Independent complaints mechanisms to check malpractice. Develop Standard codes of practice and staff training to ensure work is carried out fairly and impartially. Regular reviews of procedures, simplifying and standardising rules, increasing the use of electronic and web-based platforms. 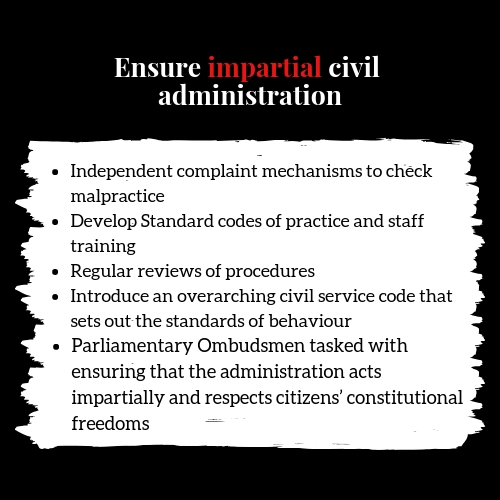 An overarching civil service code which sets out the standards of behaviour expected of bureaucrats. Committees must have proper resources- their reports claim they are hampered by lack specialist skills (legal, accounting etc), equipment and research capacity. Addressing these shortcomings is a must. The substance of democracy lies in systems of checks and balances; the division of power and processes to hold those in power accountable. Although not comprehensive, the foregoing highlights some serious shortcomings in Sri Lanka. Citizens should press political leaders to address these issues, the ongoing political crisis underlines urgency for further reform.
. Otto Ilmari Lehto. 2015. THE THREE PRINCIPLES OF CLASSICAL LIBERALISM ( FROM JOHN LOCKE TO JOHN TOMASI ) : A Consequentialist Defence of the Limited Welfare State. [ONLINE] Available at: https://helda.helsinki.fi/bitstream/handle/10138/155211/Lehto_KaytannollinenFilosofia.pdf?sequence. [Accessed 11 September 2018].
. Dr Hannah White, Institute for Government. 2009. Parliamentary Scrutiny of Government. [ONLINE] Available at: https://www.instituteforgovernment.org.uk/sites/default/files/publications/Parliamentary%20scrutiny%20briefing%20note%20final.pdf. [Accessed 29 October 2018].
. ROHAN EDRISINHA & ASANGA WELIKALA. 2015. GSP PLUS AND THE ICCPR: A CRITICAL APPRAISAL OF THE OFFICIAL POSITION OF SRI LANKA IN RESPECT OF COMPLIANCE REQUIREMENTS. [ONLINE] Available at: https://www.cpalanka.org/wp-content/uploads/2015/01/ICCPR-Chapter-Final.pdf. [Accessed 15 October 2018]. The Sunday Times, Sri Lanka. 21 March 2010. Tax sleuths go after opposition candidates. [ONLINE] Available at: http://www.sundaytimes.lk/100321/News/nws_06.html. [Accessed 15 October 2018].
. The Guardian, UK. 2010. Why the media silence on Sri Lanka's descent into dictatorship?. [ONLINE] Available at: https://www.theguardian.com/commentisfree/libertycentral/2010/jul/12/sri-lanka-journalists-threatened. [Accessed 15 October 2018].